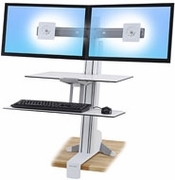 Convert any surface into an adjustable-height standing desk with the attachment of the WorkFit-S. Make computing comfortable for prolonged periods—stand up whenever you want. This sit-stand workstation is extraordinarily simple to use. With the push or pull of a hand, you can instantly raise or lower your keyboard and display in one easy motion, yet all the while the system will remain stable throughout your work routine. Fits monitors up to 24"